The house sits beside the aged cottonwood tree like a memory of bygone times. Under its tall, peaked roof the many windows beam a welcome. In the large garden to the right of the house a young girl dressed in the clothing of l867 rides a Clydesdale as it patiently pulls a plow among the blooming potato plants, turning furrow after furrow. The low double barns offer ample space for teams of horses. Ducks and chickens squawk and waddle in their yard near the fast-flowing stream. The sound of hammering comes from the blacksmith shop where a mower part is being forged. Rakes, spreaders and plows stand idle, waiting for repairs so that horses which once powered them can bring them back to useful life. Over it all is the golden light of a Cariboo autumn. Leaves are turning. Flocks of Canada geese call overhead as they leave their summer homes. Human migrants, on their way past in cars and campers, stop to admire the wide vistas and bountiful land which, in 1865, drew the Boyd family to build a stopping house here on the wagon road to Barkerville. Today it's a well-maintained B.C. heritage site, but 136 years ago Cottonwood House was a major resting place for travelers bound for the gold fields. 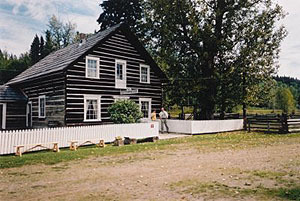 Modern day visitors to the general store and restaurant enjoy fresh cinnamon buns baked and served by smiling staff in period costume. In 1867 in this same store, hopeful miners bought their last supplies before pushing on to Barkerville and Richfield. Here, after a four-hour stagecoach ride from Quesnel, passengers had time to rest and dine in comfort while the stage changed horses. A tour of Cottonwood House, still fully furnished in the style of the 1860s, shows what a fashionable place it was. The miners have gone now. The squeak of the Cornish wheels has been replaced by the roar of motor vehicles. Most of the original stopping houses grew into towns whose names commemorate them; 70 Mile, 100 Mile House. But Cottonwood was never just a transient stopping place, it was, and still is, a working family farm, almost totally self-sufficient. 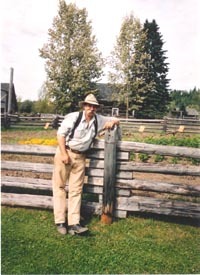 Bev Forseth, herself a descendant of Cariboo pioneers, has visited the farm often. When reading the archives, Bev was most impressed by the Boyd family's commitment to higher education. The children were sent out to continue their schooling despite the high financial and emotional cost. They were boarded far away from home and probably only saw their parents at Xmas and during summer holidays. Given the importance the Boyds placed on education, it's very appropriate that Cottonwood House is now an educational facility as well as heritage site. In 1958 the B.C. 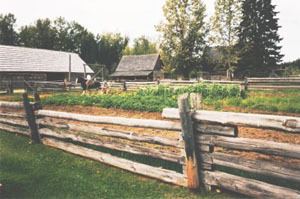 Government took over Cottonwood House as part of the Barkerville Heritage Site. It still overseen by the Provincial Government. But, it is jointly operated by a partnership of School District 28, the Quesnel Learning Facility and the Ministry of Community, Aboriginal and Women's Services. It is, says Kevin Brickwood, Manager of Site Development, "the first heritage site run by school kids." Under a youth program, for the past two years, both high school and university students are hired to work at Cottonwood. As well as their salaries, they may receive up to $800 in credits to be applied to further their education. The object is two-fold; to encourage students to continue their education, and to allow them to experience rural life in pioneer days. As Bev Forseth points out " With increasing urbanization, fewer and fewer people are aware of the cycles of our food production, whether it be beef or vegetables. Not just youth, but adults as well don't know the realities of the food chain. " Cottonwood House hopes to change that. Presently, as much as possible, they use old-fashioned methods to farm. 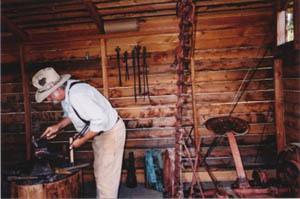 Fred Harder, the blacksmith, is making up parts to get the old machinery back in operation. Fred, an historical consultant on agricultural equipment, also restores old leather gear. The school system is involved. Students who prepare food for the restaurant are supervised by a Home Ec. teacher. There are school day trips. Some of the full time staff intend to work in the heritage field. However, there are ambitious plans to make the site an example of not only accommodation and transportation over 130 years ago, but of the thriving, vigorous way of life in the Canadian West at the time of the Cariboo gold rush. It will be a place where students and the public can stay on site, learn the skills of pioneer farming, and receive educational credits for it. A curriculum, which will tie in with regular school studies, is being developed. Classes at Cottonwood will include heritage, agriculture, forestry, and building restoration. There is hope of a sports centre, teaching kayaking on the nearby river. Students would participate in traditional farm family activities; milking cows, weeding the garden, feeding livestock, throwing hay. Using Boyd family records of what crops they planted, students will plant and sell heritage crops. They will plant following historic patterns, working with horses and traditional equipment as the pioneers did. It will be interesting to monitor weather patterns and see how crop yields differ from years ago at Cottonwood. This year, when asked if August 30th wasn't a bit late for potatoes to be blooming, Fred Harder replied, "It's been an odd year. First cold and rainy - and with the short growing season Cariboo farms can use all the warmth they can get. Now, in August, it's turned scorching hot." As farmers did 136 years ago at Cottonwood, they plant their crops and hope. Bev Forseth was pleased that, while learning pioneer life, students would come to understand the constraints on agriculture today. Weather, grasshoppers, poor harvests and markets are just as influential now as they ever were. Kevin Brickwood notes that the site offers economic as well as educational rewards. Sales of wooden heritage products in the general store presently employ 5 or 6 youth in the Quesnel district. These craftspeople also made the wooden tables and chairs in the restaurant. In 2002 they will be selling wooden clocks. The site isn't just for students. It is open to all the public. In 2002 a campground will be developed where the public may stay and take part in work on the farm. If you've always wanted to drive a Clydesdale or forge a horseshoe, this may be your dream vacation. Two bunkhouses for students were moved in this summer and a cookhouse, available to both students and the public, is following. Cottonwood House is a step back in time, a quiet place, where, if you concentrate, you can almost hear, below the rustle of cottonwood leaves, the jingle of harness, the thud of horses' hooves, and the "Whoa!" of the driver as a stage-coach rumbles down the hill. And, in 2002, people will be working as their great-grandparents did in the fields and barns; understanding the importance of horses in pioneer times, the effort required to grow food, and the hard work and deep satisfaction of farming. As Site Manager, Kevin Brickwood, says, "The future is limited only by our imaginations." Cottonwood House is 35 k (21 miles) east of Quesnel on Highway 26. Barkerville is 54 k (34 miles) beyond it. The site is open from mid-May to the September long weekend. Regulations against foot and mouth disease apply. From the first snow fall until Xmas there are sleigh rides complete with historic talks and tall tales around the bonfire.